In my previous post When to Scarify your lawn, I emphasised how important it is to remove dead grass, thatch and lateral grass growth in your lawn. Too much thatch and lateral grass means the that the desired grass has to work very hard to push through and reach the air and also absorb sunlight. Sunlight is essential for photosynthesis to take place and if your grass has to work too hard it will weaken and non desirable grass species, as well as moss, can start to colonise the surface of your lawn. Moss is often wrongly described as the cause of a poor lawn. Moss is, in fact, a result of having a poor. The rule of thumb is, keep your root-zone in good condition, improve overall growing conditions and your grass will grow strongly, making it impossible for moss and weeds to compete. Good aeration is essential but sometimes you might need some chemical help to assist - a simple treatment is the application of sulphate of iron, to help suppress the moss. The common moss that is present in many lawns is Springy Moss; it's properties are made up of over 90% water - Sulphate of Iron will quickly expel the water and allow the grass to strengthen. 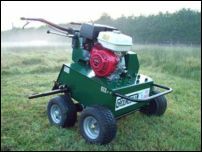 Even after as little as one hour, moss will start blacken; after two days, the moss content will have reduced and turned dark brown whilst the grass will have turned extremely green. Always try to apply Sulphate of Iron on a dry still day but with rain imminent - ideally no longer than 12 hours . (this is to avoid scorching) the moisture dissolves the sulphate of iron. Once the moss has died back, you can scarify out the debris - ideally 5-14 days after application. Sulphate of Iron is often referred to as iron sulpahe - either/or really. The material is very fine and will easily blow everywhere if applied in windy conditions; be very wary and try only to do this job on a still day - wind-blow materaial will scorch any soft tissue on plants close to the lawn. Do not rely on the drop spreader's gate calibration and always follow a simple calibration method as I described in the post calibrating a fertiliser spreader. It is inadvisable to store open bags sulphate of iron through the winter - the dry powdery material absorbs even the lightest of atmospheric moisture and the material can become lumpy and unworkable through a drop spreader - try to buy just enough for your needs, although you can use sulphate of iron throughout the winter provided the grass is not frozen. If you do find yourself forced to use material that cannot be distributed through a spreader, it is possible to apply sulphate of iron suspended within a water solution. Measure out the required amount of material and water that is needed if you wish to apply as a liquid, add the sulphate of iron to the water and stir until all of the lumps are dissolved - let stand overnight. The following morning, sieve out the liquid using a funnel and old stocking. You will have noticed that there will be residual powder at the bottom. This can still be used later, now calibrate your sprayer and apply the iron solution to the lawn. just wondered is it legal to use? As it has no approval for use as a moss killer or maff number. As far as I am aware, there are no legal restrictions for using Sulphate of Iron as a moss killer on lawns. Can I suggest that the regulations be checked re the use of Sulphate of Iron for killing moss on lawns that does not have approval. I agree very much so with your use of SOI but there was a time as I recall it when it had to be approved in the UK. Ferrus Sulphate application is not covered by legal restrictions. However be cautious about using it. Inhalation of the dust over a period of time is no good to you, using it on poor soil structures can cause leaching & concentration at the water table leading to "Panning". Also the crystal breaks down rapidly with the application of boiling water. If using CP sprayers make sure that the tank is well washed out after application, I have seen many rubber seals perished & the old metal filters rusted. What rate do you suggest for either dry or wet spreading? Can anyone tell me at what rate I want to spread iron sulfate granules on my lawn to kill the moss? You could mix suplphate of iron with sand but why would you want to do that? Are you getting confused with lawn sand - a mixture of ammonium suplhate and ferrous sulphate? An easier way to use SI is to dissolve it yourself in a watering can with hot water. You will need about two plastic coffee cups per full can, just water the affected areas liberally. It has been noticed there is nothing on SI's moss killing qualities on any of its packaging. This is due to it being considerably cheaper than weed and feed. To answer the question on mixing sulphate of iron and sand I would recommend a 3 to 1 ratio fo sand to iron suplhate. Make sure you use gloves. To answer the question about rate of lawn sand, it should say on the lawns sand pack. If it doesn't try 80 grams per square metre. 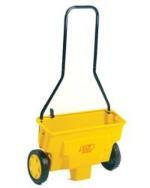 I find a lawn spreader with lawn sand is much better then a sprayer with liquid solution for killing moss. Make sure you walk at a steady pace and try not to overlap. A good tip is too mow the lawn and use the srtipes as guides. Do you have a tip to buy sulphate of iron online? Can't seem to find it at garden centers in Ontario Canada. Does it go by another name? With our brutal drought anything to help our poor lawn I'm willing to try. I put it down too thick in a spot and now nothing grows there. How should I fix it? Cliff - you will have to wait for the iron sulphate to dissipate, then re-seed the damaged areas. Hi - I used to get Sulphate of Iron for moss killing on the lawn for my Dad from a local garden supplier, which closed down. We've seen it recently in a garden centre but the box stated it was for use on soil around plants/vegetables. Would this be the same 'stuff' and could it be used on the lawn as we used to?